Digimon: System Restore: Digimon Savers Movie: Ultimate Power! Activate Burst Mode!! Digimon Savers Movie: Ultimate Power! Activate Burst Mode!! 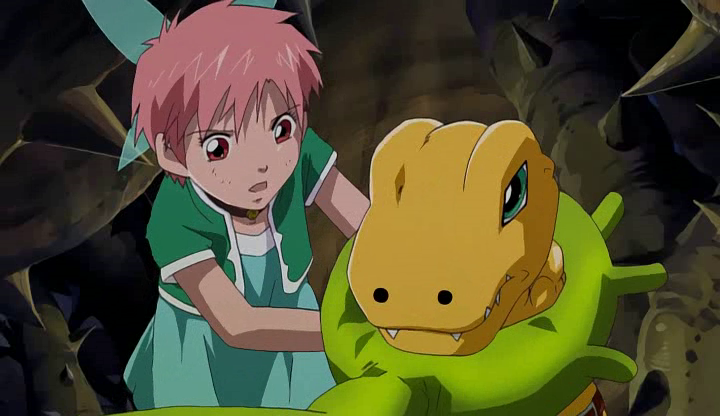 In this movie, Agumon tries to save the world all by himself to impress this girl he picked up. Like most of the movies based on the TV shows, you're not going to find a whole lot of substance here. After the train wreck that was the first Zero Two movie, the mold has been a short side story where some villain comes out of nowhere to threaten the city/island/world and is stopped just as quickly. The Savers movie doesn't stray from this formula and thus will never go down as anything of consequence. While the Tamers, Frontier and second Zero Two entries got posthumous dubs prior to Data Squad's American launch, there was nothing of the sort for this. Nor does there need to be. That's why this is the Savers movie and not the Data Squad movie. At the same time, the movie does take some novel approaches to the formula that at least makes it worthwhile entertainment. The biggest one is that it takes the humans out of the equation, cursed into a deep sleep by bad guy Argomon, one of the more threatening grass-types you'll ever run into. This puts the spotlight on the Digimon half of DATS. It's rather enjoyable as the various quirks of this trio is often shadowed by the strong personalities Marcus Masaru and Thomas Touma have (sorry, the Babel fish is still taking hold here). Without those guys, we get to enjoy the Digimon doing their own thing, yet with characters that we're already familiar with, unlike the steep learning curve into the X-Evolution world. In an odd way, the absence of the human characters reinforces their necessity to the team. You better appreciate a human's ability to aid Digimon when you see how dicey things get without it. Without the aid of a well-timed Soul Charge, it makes the initial fight against a gang of ornery Goblimon a lot more interesting. Normal protocol would be for at least one of them to pop up a level or two, especially with that Ogremon around. Instead, they have to get a little scrappy, using natural advantages like the narrow alleyway, the chandelier, and the sausages. Gotta love the sausages. If your love for Lalamon doesn't double after watching this movie, you didn't watch this movie. Despite Lalamon's sausage nunchuks (and her airlifting work, and her aerial combat against a fleet of Pipismon, Agumon is the main focus here. With the humans out of the picture, he instead gets the next best thing. Rhythm, despite not looking like a Digimon, not adhering to the proper naming convention of a Digimon and not having the special abilities of a Digimon... is a Digimon. This is never adequately explained, and is by far the most curious thing about this movie. Unfortunately, everybody just seems to go with it, so it's never addressed. You get the sense that the writers were so desperate for some sort of human element and winged it. She has this sweet little rapport with Agumon, but it's a bit of a cop-out. Still, even with Rhythm as a confusing human replacement and Argomon as a flat anti-human antagonist, the parallels between the two are apparent. Argomon, a Digimon that's as monstrous as they come, has observed humanity's destructive behavior, sees a threat of it spilling into the Digital World, and is making a preemptive strike. Rhythm, a Digimon that may as well be human, sees the potential good in humanity and wants to know more. Learning more about how Rhythm escaped the Digital World, her proper perspective of humans and who she is (and how she's connected to Argomon), would have gone a long way. It certainly would have added a lot more than Masaru did, showing up at an opportune time to help Agumon evolve and save the day. It's a shame ShineGreymon was needed at all. It would have made for a more satisfying conclusion if Agumon had figured out a way to beat Argomon with no human assistance. Perhaps Rhythm could have helped. 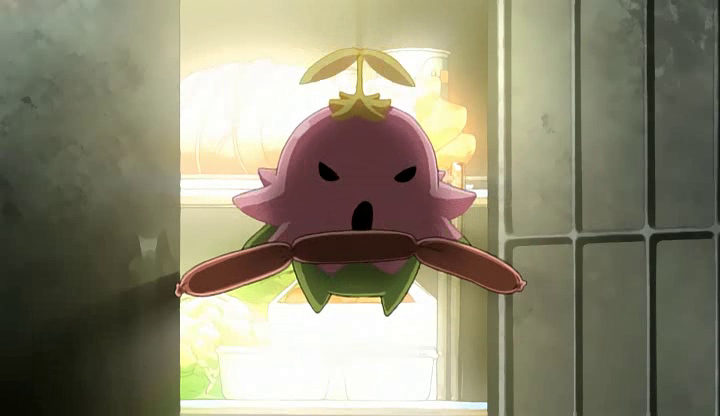 Or Lalamon and her sausages. What really made Lalamon's sausage stunt hilarious was that not only did she start munching on them, but so did everybody. Gaomon sheepishly asking for one and Rhythm happily obliging is one of the cutest scenes in the movie. Argomon sets himself up as being so mighty and dominating, yet one fireball from Agumon sets his entire vineyard up in smoke, releasing the humans from their slumber. Talk about super-effective. Even though he's referred as Argomon in every media I could find, the name Algomon seems so much more appropriate, just so you have the two opposing Digimon being Algo and Rhythm. One more oddity about Rhythm is that even though she's a Digimon, she appeared to help Masaru with his Soul Charge that activated the Burst Mode. Coolest thing about the ending credits? Outtakes! Agumon crashing, Lalamon unable to support Rhythm, a burning Algomon falling over (and needing the crew to extinguish the flames). It's very random and very cool.